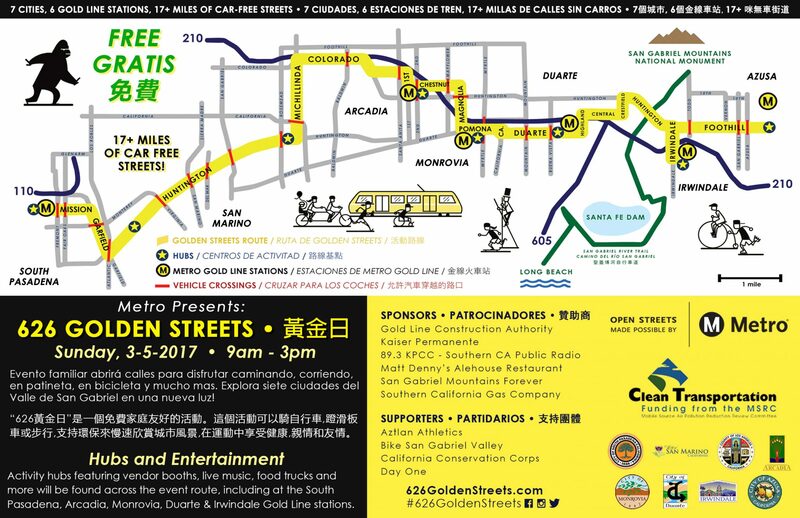 626 Golden Streets, the biggest Open Streets event ever to be held in North America, had to be postponed last year due to the San Gabriel Complex fire. We were really sad about it. Gabe the Sasquatch cried a little bit. But now it’s 2017 and 626 Golden Streets is upon us once more with 17-plus-miles to walk, run, skate and bike across the San Gabriel Valley — including some roads, such as Huntington, that are often congested and not very bike friendly. Make sure to buy and load your TAP card in advance to avoid lines at TVMs. Roundtrip fare is $3.50 in Stored Value. Here’s your standard “bikes on board” reminder: please keep in mind that if the train is full, you’ll have to wait for the next train. Use the designated space for bicycles. For your safety and the safety of others, do not block doors or aisles. There are eight activity hubs along the route that will have music, food, dancing and more! The hubs will also provide free water, first-aid for anyone who needs it, and information. Buses will be detouring through the San Gabriel Valley due to street closures. Details will be posted on Metro’s Service Advisories page. 626 Golden Streets was made possible by Metro’s Open Streets grant program. So excited! Hope it doesn’t rain! I can’t wait! Only 18 more days to go! Be sure to look for me! I’ll be shooting the event. If anyone is interested in volunteering at the event, please send an email to 626gsvolunteers AT gmail DOT com. Thank you!